Last week, the elementary and middle school buildings kicked off the month with the book fair in their Library. West Oakview is holding a Book Bingo on Friday, March 15th from 5:30-7:00 PM. It’s requested that each family bring one book per player, but you are welcome to bring more than one! East Oakview is also having a Book Bingo on March 20th at 6:00 PM. Highlands Middle School teacher Marli Oliver has organized a complete March Madness reading tournament for all of their students. North Oakview is celebrating reading in many ways. They have a bulletin board setup showcasing pictures of teachers “caught” reading books. Then in the weekly newsletter parents are being asked to send in pics of their kids caught reading at home to be added to the hall display and put in future newsletters! 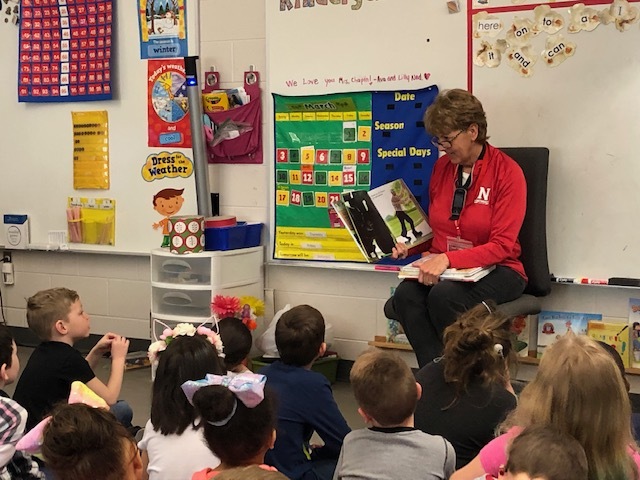 Here is one our very own Board of Education members (Mrs. LaBerteaux) reading to a class at West Oakview Elementary for March is Reading Month.